Look how cute they are! Glad you had a great valentines! Have I told you a thousand times yet that I love Beagles!!!! 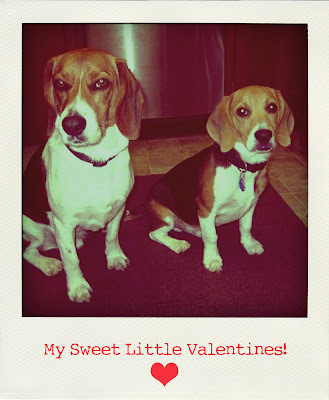 The boys are sooooo cute....my mother says you must be a neat person if she has 2 beagles! I think she is right!! Hello! Just thought i should say hello at last, since i have hanged around here for a while. :) Really nice pictures and what a cute couple of friends you have there. Hi, I love your Beagles, give them an extra big cuddle, as I have just had to put my gorgeous Maltese to sleep after having her with me day in and day out for 16 years.